last fall, i got the momofuku cookbook. while i usually use cookbooks as jumping off points to get ideas on some weird thing i want to do, with this book, i find myself wanting to make everything, by the book. as it were. the book chronicles the three new york restaurants of david chang. momofuku noodle bar, momofuku ssam bar and momofuku ko. i've been to noodle bar and ssam bar and loved them both. cooking out of the book has been an exercise both of replicating favorite dishes from those places and trying things i haven't had there, since i like 1,000 miles away and all. but ko is different. ko has 12 seats. and no waiters. and a ton of buzz. unlike the other momofukus, it takes reservations. unlike the other momofukus, it doesn't take phone calls. getting in means winning an online lottery held every day at 10 a.m., a week before the day you want to go. by all indications, in the early days, this was an improbable lottery to win. but as time has passed, some of those seats are still available a full 35-40 seconds after they become available at 10 a.m. so if you want them, you can probably get them. 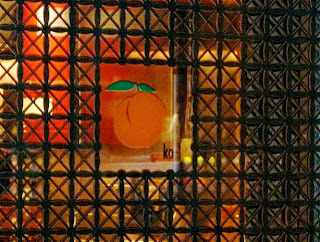 ko is a couple doors down from noodle bar. the first time i went to noodle bar, we walked past it three times before we found it. i was better armed with the actual address for ko, and managed to only walk past it once. it has a bit of a speakeasy quality to the outside. there is a window and a door, and they are covered in decorative armor. 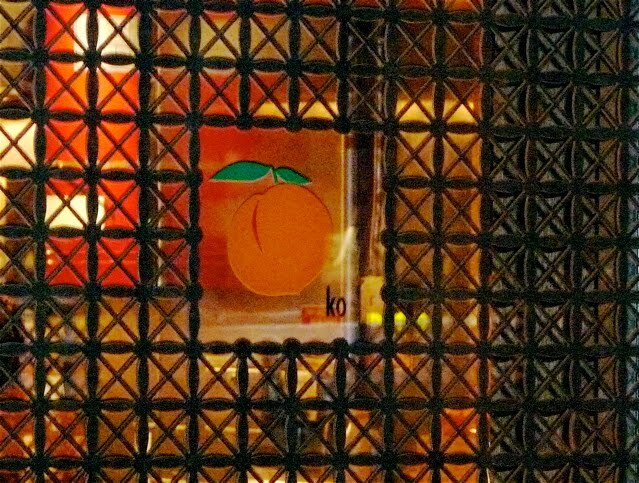 on the door, there is a small cutout with a peach logo (momofuku means "lucky peach." allegedly.) it even says "ko" on the door. barely. if you look close. and are previously aware that it might. so i walked in with my pal wayne, and it was not unlike walking into my favorite book. it just so happens my favorite book is a cookbook. all the seats are at an L-shaped bar, 10 down the length of the bar and 2 at the end. wayne and i scored the 2 seats at the end, which is like winning the lottery twice as far as i am concerned. 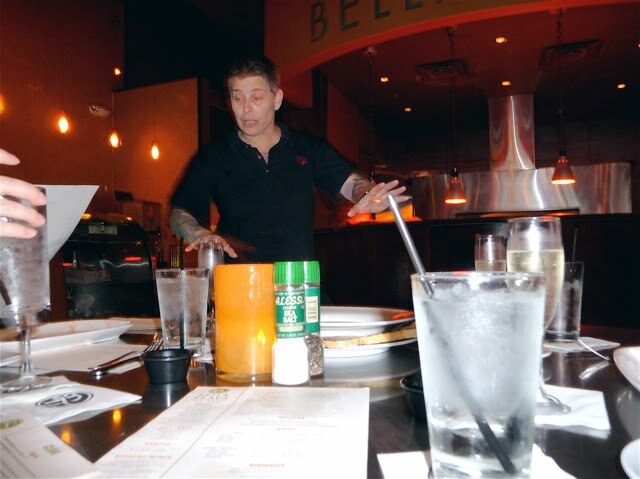 dishes are prepared by the 3 chefs behind the bar and handed to the diners. there are 2 wait staff on the customer side of the bar to clear plates and deal with drinks. but that's it. there are no choices to be made. there is no menu. you sit down, are asked if you have any allergies they need to know about, and then it starts. you don't see a menu to get an idea what's coming, and you don't get a menu afterward for posterity. i was warned by my friend christine that they frown on you taking photos of the dishes. and while i often like to take photos, i wouldn't have here even if they were ok with it. it's sort of like you're sharing a table with 10 strangers, and i only take photos when i can be stealth. there was no being stealth here. so, that's why you get the one photo of the door. so, the food. there is no menu, not even a printed copy of what you ate afterward. so this is all from memory, and could be wrong. an overview: i liked everything except on dish. we'll get to that one. -- amuses: we sat down and almost immediately got four small starters. first was a tiny cube of cornbread with a translucently thin slice of pickled turnip on top. then a spoon with a littleneck clam and crispy buckwheat and black garlic. the clam was in a broth that i suspect was bacon dashi. then a togarashi-dusted chicharon. very spicy fried pig skin. finally a black pepper biscuit with mirin glaze. each thing came at you with a different kind of big flavor in a tiny bite. -- first: sashimi of long island fluke. the raw fish came with very bright english peas and a salad of sea beans and rice pearls (think rice krispies, only better, with more crunch). this course was very subtle and understated after the amuses, and wayne said it was "nice to turn down the volum," which was a good way to put it. -- second: beef carpaccio. never had carpaccio before, and now its like people are throwing it at me everywhere i go. this one came on a rectangular plate, and the paper-thin sheet of raw beef was slice to fit perfectly in the flat of the plate. it was dressed with quark cheese, horseradish, radish greens and rice chips, which are different than rice pearls, but similar in crunchy effect. this plate looked like a painting. makes me sad that i don't have a photo of it, because i would put it on my wall. -- third: brioche toast. we get a bowl with a piece of toast in it. it is slathered with bone marrow. there are roasted pearl onions and wood sorrel in the bowl. then the chef pours a broth over it. it's a cheese broth, made of gruyere and comte cheeses. it was like the best cheese toast ever. -- fourth: poached egg. one of the sorta famous dishes. a soft poached egg is split open on the plate and the opening is filled with hackleback caviar. on the side were tiny potato chips, and underneath was onion soubise. onion soubise is in the cookbook, and i kind of read over it because there didn't appear to be anything to it. there is something to it. i loved the whole dish, and i think it was because of the onion. it was like candy. -- fifth: pasta. after i had this, i presumed nothing could overtake it as my favorite. we'll see how that turned out in a minute. it was hand-torn pasta on top of cubes of sausage made of chicken and snail. i dunno, but it was good. on top of the pasta were chips of crispy chicken skin. oh yeah. there was no mention of the sauce, so i asked. it was a reduced chicken stock. it was like butter. -- sixth: skate. this one never really had a chance with me. skate is one of my least favorite fish. i always find it unpleasantly mealy. and if that wasn't enough, it was sitting on top of cauliflower, which is my least favorite food on the planet, i think. also under there were olives and fresh water chestnuts, both of which i like, but not enough to enjoy it. there was an almond milk foam there, too. in the pantheon of dishes combining some of my least favorite foods, this wasn't bad. i finished it. but i didn't love it. -- eight: muscovy duck breast. i wasn't full at this point, but close. and when i saw this course coming, i was afraid because it looked huge. i didn't need huge. but then i realized it was duck, and everything was suddenly ok. it was the best duck i've ever had, and duck is what i order anytime i am at a restaurant that has it. not close. the meat was perfectly cooked medium rare, and the skin was cooked shatteringly crisp. so, so good. it was on top of charred mustard greens, which were fine, their bitterness counteracted the sweetness of the duck. and there was a honey-braised turnip beside, but the duck! wow. when we were served, there was no mention of the sauce, and it was amazing, so i asked. pomegranate glaze with foie gras. of course there was more foie. -- dessert 1: spiced white wine sorbet with pear. that about says it all. -- dessert 2: pretzels and root beer. the "pretzels" were panna cotta, so, like creamy gelatin. take my word for it. it tasted like pretzels and there was salt on top. the "root beer" was a sorbet, and also delicious. it was sitting on some sort of bread crumb, but i forget what. like mustard with your pretzels? that was there too. in the form of gelee (think jell-o). 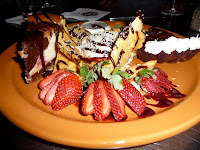 it was one of the most interesting desserts i've had, and loved it. afterward, we talked to the chef who had been camped out near us, shawn (or sean? sorry, don't know) and told him what a great time we had. by that point, i had been awake for almost 21 hours and i was ready to collapse. but i was happy. so, i have been trying to write this post for more than a month now. 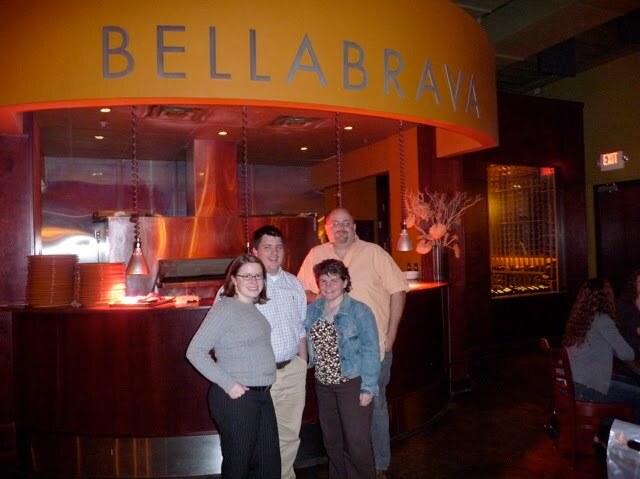 for my birthday, we went to bella brava, which is where my pal domenica macchia has been the chef since last fall. ever since she moved there, i have been plotting a night when pam and i went in, armed with becky and jeremy, and ordered a bunch of stuff so i could do a comprehensive post. so on my birthday, we got becky and jeremy and went in, suspecting we were committing ourselves for the next several hours. dom knew we were coming in and we left it to her to decide what we were going to eat. as it turns out, just about everything on the menu. here is where it got complicated for me to write about: everything was great. and i knew it was going to be. there was stuff i had had before, stuff i never had before, stuff that was on the menu, going on the menu soon, or just for us. we loved it all. so when i started to write about it, it all started seeming like a lifeless list of things we ate more than a description, and i felt like i wasn't doing it justice. i can't be remotely objective when it comes to dom. i mean, you've read previous posts. i like just about everything. but the only way i can write anything worth reading is if i went in to the meal thinking that there was some chance i might not like it. i mean, i had concerns going into babbo. i suspected that i wouldn't find french laundry to be perfect. i was openly skeptical as to whether i would even like alinea. and those were three of the best meals i've ever had. but i walked into bella brava knowing i would love whatever was about to happen. because i wasn't just going there for dinner. dinner was being made for me. for me. dom refers to me as the brother she never had, and i love that. i have to be careful about reciprocating that sentiment because it would probably really piss off my sister. but you know what i mean. so, in list form, here is what we had. everything was great, so i can dispense with individually nothing that everything was great. -- roasted beet salad. sliced red and halved baby golden beets with a vinaigrette. everyone else got cauliflower on theirs, but i did not. because it was my birthday, she didn't even try to talk me into eating cauliflower. dom said after peeling the baby beets, she would only serve regular beets in the future. i understand. but they're so cute. -- beef carpaccio. i had told dom that i never had carpaccio, so boom, there it was. thin slices of barely seared filet with parm, arugula, preserved lemon and fried capers. -- two pizzas: the vegetali with roasted vegetables on it, and a sausage. -- gorgonzola fonduta: a blue cheese sauce served with grilled bread for dipping. jeremy said he gets this whenever he comes in because he loves it so much, and after tasting it, said there was something different. he said it had a different alcohol taste. he told dom this, and she said she just got a different, better brand of sherry. this is why i hang out with jeremy bowers. -- lamb porterhouse: tiny little grilled t-bones. she had just changed over to the spring sauce for them, a mint-pea pesto. -- duck: always my menu fallback. love it. she has a cherry-port sauce. -- roasted half chicken: the marsala-lemon jus was amazing. -- crab cakes: they were huge. tiny would have been great at this point. no one could eat a whole one. -- salmon fettucine: this was a sample of a new thing. not a big salmon fan, but am a big pasta fan. this was good. after all that, as if we could still move, dom sent out a plate of all their desserts. the open-faced canoli is always a favorite. and the nutella cheesecake. and the chocolate torte. and the vanilla panna cotta. and a bunch of strawberries, to keep it healthy. see, didn't that work better as a list? all this to say, i highly recommend becoming best friends with dom and going to bella brava on your birthday. ps: when we arranged to go in, i told dom that i would let her cook for me on my birthday only under the condition that she let me cook for her on hers. her birthday was a week after mine, but she was busy, then i was gone, but this is just to make it publicly official that it has to happen. and soon.